This site is dedicated to the descendants of the 15 men and boys that were murdered at Porvenir, Texas in 1918 by the Texas Rangers. ​On January 28, 1918 , the crack and bang of gunfire broke the silence in the air. Bullets cut through the night air and ripped through the bodies of 15 men of Mexican Descent, Texans, fathers, sons, brothers, and tios. These bullets killed 15 innocent men and boys; 15 men and boys of a little village in a west Texas town of Porvenir. The night of the massacre at Porvenir set in motion a chain of events that would forever change the face of the historical Texas Rangers. It has been said that history is written by the victors. But you cannot spell history, without the word story. The story of Porvenir, after so many years of cover ups, is now being told . When people outside of Texas hear the words Texas Rangers, they think of a baseball team in Arlington, or a TV series starring Chuck Norris. Here in Texas, many think Texas Rangers are tall handsome men in tailored suits, wearing cowboy hats and impeccably polished cowboy boots investigating crime as the premier law enforcement agency in the Lone Star State with a well-earned and storied past. But like all of us, their past isn’t without its own mistakes, scars, missteps, and shame. A hundred years ago, the Texas Rangers were far from the well-trained highly respected unit of Texas lawmen as they are known today. On January 28, 1918, the Texas Rangers, then not much more than a collection of rednecks and hooligans, rounded up 15 men and boys in the little village of Porvenir and assassinated them, leaving 15 families made up of their wives and children, alone, defenseless and having to fend for themselves long before being a single mother was a commonplace. Fifteen (15) brown men, massacred by white men of the Texas Rangers. I keep repeating “15 men and boys” for a reason. I want to give those of you not familiar with this story some context. Can you imagine how big of a news story it would be, if 15 men and boys were killed in Texas today at one event ? It would be a national story. Porvenir would have been swamped with the media coverage. And while those 15 men and boys perished that night, and their blood was spilled on the desert sand, their blood still runs deep in the veins of their descendants today. The fight for justice for those their family members will never cease. The families of the massacred of Porvenir want their story told so that the truth may set their spirits free from the chains of lies, deceit, and cover-up that has happened for the last century. This site is for the descendants of the 1918 Porvenir Massacre and for anyone who cares about the true history. This site will continue to set the record straight. There are many different stories that are being told. This site will share the true facts as we know them today. This is a story that needs to be told and the history that we must never forget. The facts that will be shared on this site hopefully will encourage readers to go out and share the facts, the stories, and the HISTORY! We also must not forget the people who stood up and fought for justice, no matter the cost. 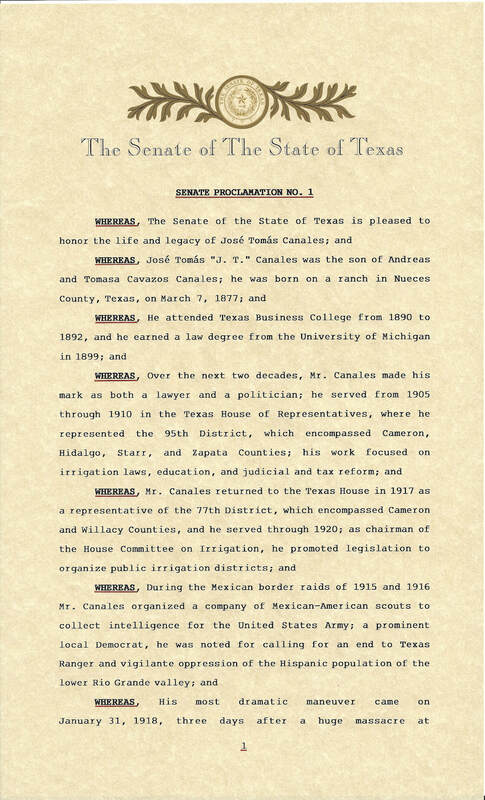 Mexican American state legislator in Texas at that time was José T. Canalas. He had the courage to stand up against the establishment and demand an investigation against the Texas Rangers. Canalas held hearings on the massacre in the Texas legislature. Those hearings were not without repercussions for Canales. So much so that he ultimately did not run for another term due to the threats on his life, but not before ushering in a sequence of reforms that cleaned up the Rangers and set the Texas Rangers on the path to become the organization of well-trained and brave lawmen that they are today. Canales would later go on to become a founding member of the League of United Latin American Citizens, now known as LULAC. ​We can't forget the school teacher, Harry Warren. He refused to remain silent. He could have easily kept quite, moved away with his family and he could have left the massacre behind to become a story lost in the West Texas winds; but instead he insisted on bearing witness to this atrocity. He immediately documented the tragedy and became a target for everyone around him to blackball him. He could not find a job anywhere so he had to leave Texas and became a cotton picker in Arizona. Years later he did returned to Texas where he belonged. His granddaughter Olivia Warren Morales still lives in Texas. These two men, José T. Canales and Harry Warren ensured that the deaths of 15 innocent men an boys would not be in vain. Texas State Senator Jose Rodriguez represents District 29 which includes El Paso, Hudspeth, Culberson, Jeff Davis and Presidio counties. Porvenir would have been in District 29 if it still stood. Before Senator Rodriguez became a senator his was a very successful attorney and was known for his community serve. His success has always been driven by his humble beginnings. He was the son of migrant farm workers and worked out in the fields to help support his family of nine. He was the first in his family to attend college. His hard work paid off and now does a phenomenal job as Senator of District 29. He was responsible for acquiring the Texas State Capitol auditorium for the Centennial event. 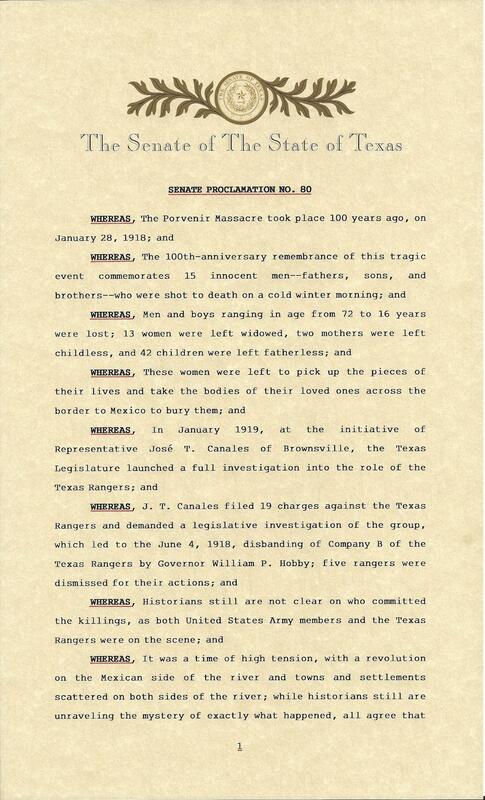 He also sponsored two Senate Proclamations in honor of the Victims of the Porvenir Massacre and Jose T. Canales, Texas State Representative in 1918.